There are times when you may need a little help removing a hook from a fish's mouth. If you're removing a large fly, you may find it handy to have a needle nose plier on hand to give you a little leverage. Needle nose pliers usually have some teeth on their jaws to help grip the fly, and the handles will help you ease out the hook. If you're removing a smaller fly, you may find that a hemostat works better. That's right… one of those little scissor-like pliers they use in the hospital to help hold things in place. Hemostats have a lock that will let you lock it shut. While you may not need this when actually removing a hook, it makes a killer alligator clip to keep your hemostat attached to your shirt or vest, until it is needed. Some hemostats also have a curved end to help you work from an angle. You'll find your needle nose fishing pliers or hemostat also comes in handy in tying your leaders. Some people prefer one or the other depending on what they're catching, as well. Smaller fish like trout and perch work well with a hemostat to remove hooks, while larger species may require the strength of a needle nose pliers to do the job. These two tools have other uses in your tackle box as well. Hemostats can be used to crush the barbs down on hooks before you use them. This helps make it easier to remove the hook after you've caught the fish. This is especially important if you practice catch and release. If you happen to catch a hook in your clothing while casting, you'll be grateful you took the time to crush that barb with your hemostats. Hemostats are also used to help remove tiny flies from the foam backing that keeps them safely tucked away in their fly boxes. If you're using tiny midges, you'll be grateful for your hemostat. It will also come in handy for holding your fly while you're getting ready to tie it onto the tippet. The locking mechanism comes into play here, keeping your fly steady. While you can use needle nose pliers from the hardware store, you can get some cheaper ones that are specially made for fishing that are equipped with a barb crusher, a hook eye cleaner, and a hole in the handle. They can be hung on a retractor for easy use. They are made of stainless steel, and are made to last for years. Handles are covered with a smooth grip. On the higher end you can get a needle nose pliers with ergonomic design and a lock on the handle like a hemostat. Available in two sizes, this "ultimate" fishing pliers is made of stainless steel, and comes with all sorts of built-in bonuses. The pick tip can be used to switch out split rings or hooks, and it works well for catch and release. The nose has crimping and cutting tools, and a hole in the middle that can be used as an attachment ring when the pliers are locked. It also features a line cutting area. Hemostats can be found at flea markets, medical supply houses, or tackle shops, both online and off. 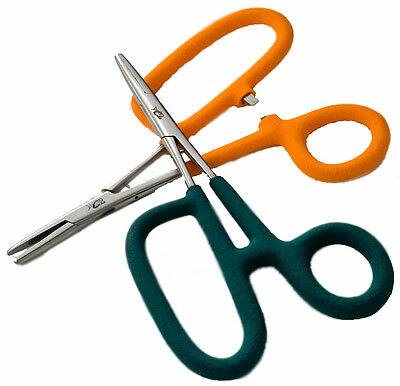 Hemostats can cost anywhere from $5 to over $25, depending on what type you buy and where you buy them. You can get them in various sizes and styles according to your needs. Many are around four to six inches long, either of which is a good size to keep on hand. Some have curved tips that are useful for working from an angle. You could also try a multi-tool, many of which come with small pliers that may work just fine. Personally, I like to use fishing pliers and/or a hemostat. With neuropathy in my hands, using a multi-tool is too difficult. For further information, visit our ONLINE FLY SHOP.